Figure 1: USS Penacook (1898-1947) photographed during the early 1900s. She was later given the hull number YT-6, and ultimately YTM-6. US Naval Historical Center Photograph. Click on photograph for larger image. 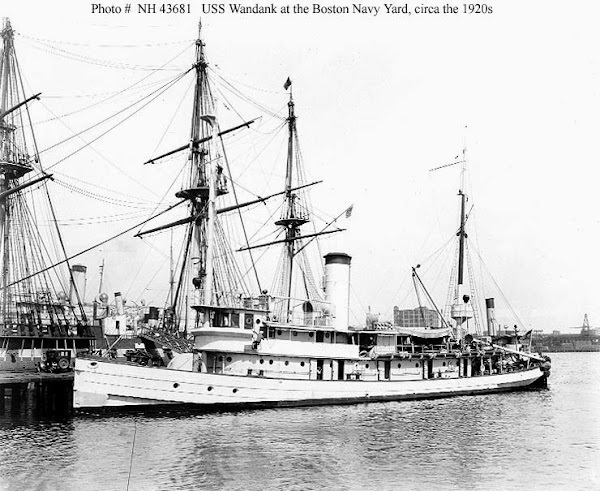 Figure 2: USS Penacook in an east coast harbor, circa the 1900 to 1915 era. Donation of Dr. Mark Kulikowski, 2005. US Naval Historical Center Photograph. Click on photograph for larger image. 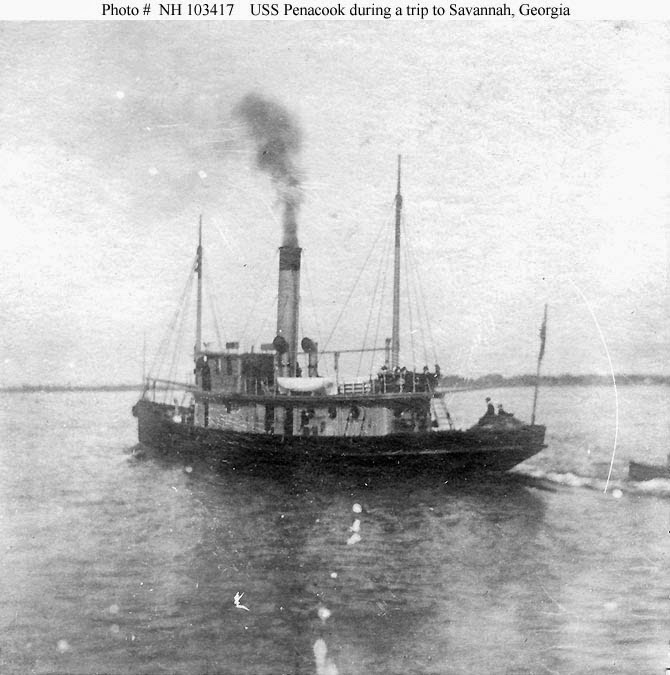 Figure 3: USS Penacook underway during a trip from Port Royal Naval Station, South Carolina, to Savannah, Georgia, circa 1901 to 1902. Courtesy of the Naval Historical Foundation, Washington, DC, Collection of Rear Admiral Raymond Hunter. US Naval Historical Center Photograph. Click on photograph for larger image. 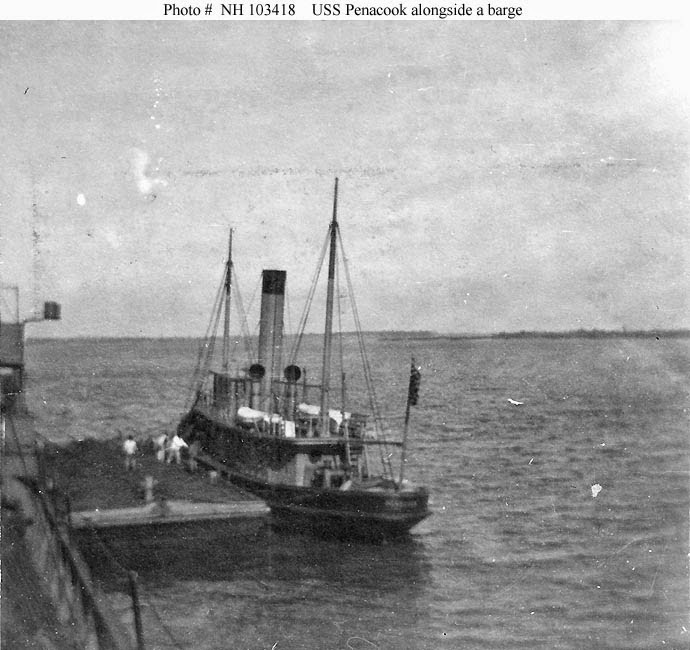 Figure 4: USS Penacook alongside a coal barge, circa 1901 to 1902, probably at the US Naval Station, Port Royal, South Carolina. Courtesy of the Naval Historical Foundation, Washington, DC, Collection of Rear Admiral Raymond Hunter. US Naval Historical Center Photograph. Click on photograph for larger image. 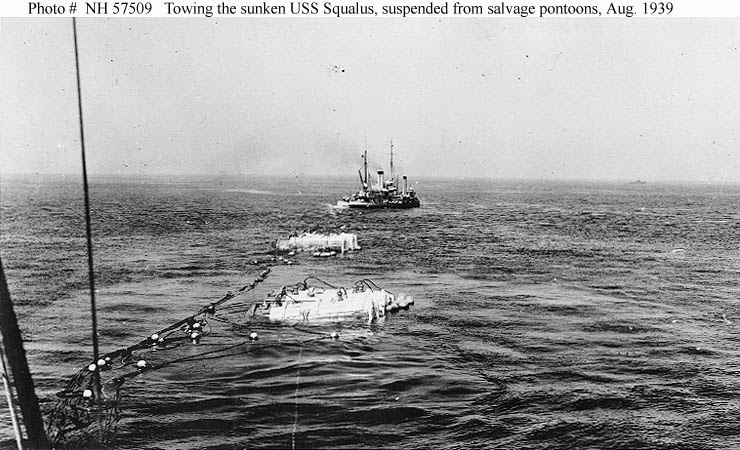 Figure 5: USS Squalus (SS-192) Salvage Operations, 1939. View taken from USS Falcon (ASR-2) on 12 August 1939 after Squalus had been lifted off the sea bottom and was being towed to shallower water, supported by salvage pontoons. 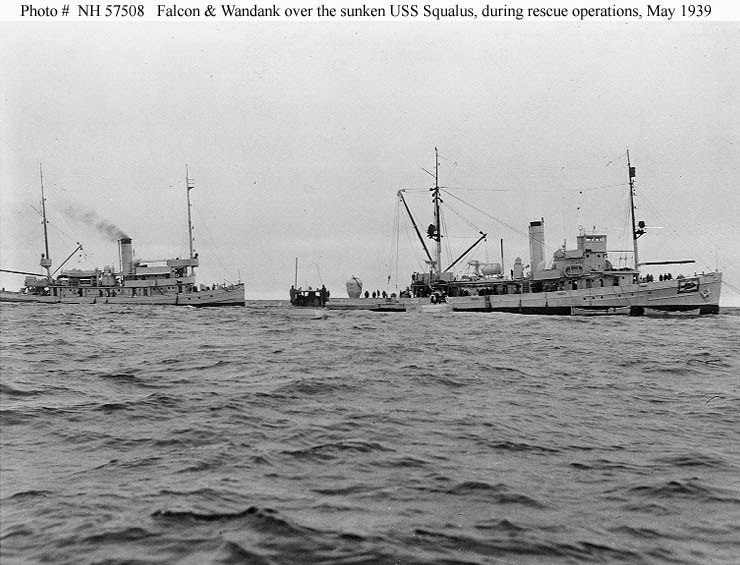 USS Wandank (AT-26) and a smaller tug (probably USS Penacook, YT-6) are towing, while Falcon acted as restraining ship. There are groups of three pontoons each visible on the surface at the submerged submarine's bow and stern. One more pontoon was underwater at the bow and three more at the stern. Official US Navy Photograph, from the collections of the Naval Historical Center. Click on photograph for larger image. Figure 6: USS Squalus (SS-192) Rescue Operations, May 1939. USS Wandank (AT-26), at left, and USS Falcon (ASR-2), which were assisted in the Squalus salvage operation by Penacook, are seen moored over the sunken submarine during rescue operations, circa 24 May 1939. The McCann Rescue Chamber, which brought 33 of the submarine's crewmen to safety, is visible on Falcon's after deck. Twenty-six men, though, drowned when the submarine initially sank. US Naval Historical Center Photograph. Click on photograph for larger image. 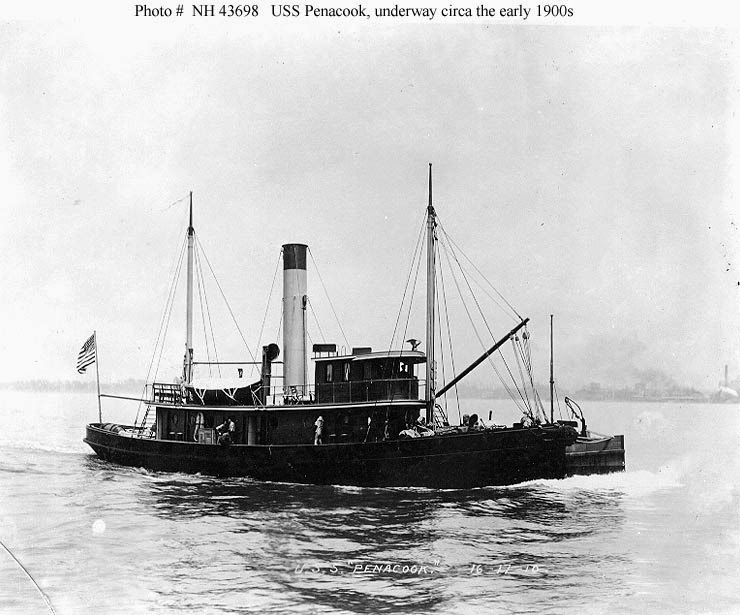 Named after a confederacy of Algonquin Indian tribes, the 230-ton USS Penacook was a harbor tug that was built by the New York Navy Yard in New York City, New York, in 1898. She was approximately 92 feet long and 21 feet wide and had a top speed of 12 knots. After being completed, Penacook was assigned to the Port Royal Naval Station, Port Royal, South Carolina, until about 1905. She then spent a few years each at the Guantanamo Bay Naval Station, Cuba, and the Norfolk Navy Yard at Norfolk, Virginia. 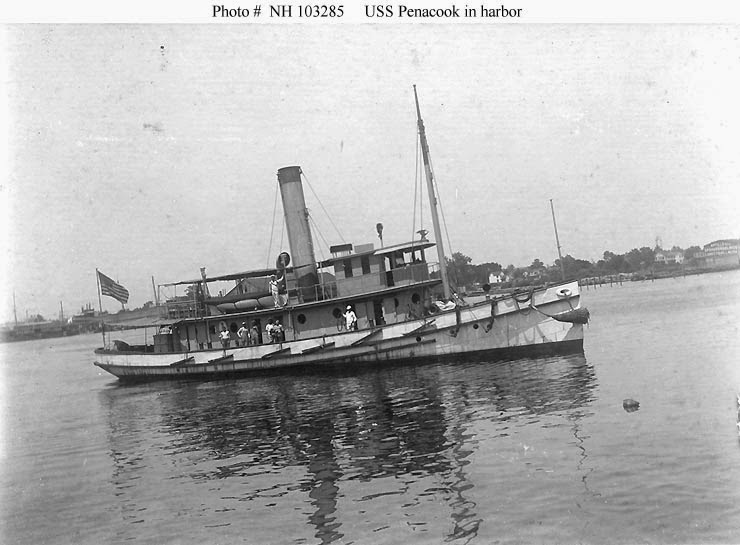 In 1911, Penacook became a yard tug at the Portsmouth Navy Yard at Kittery, Maine, and served at that facility for the rest of her career. In 1920, Penacook was designated YT-6. In 1939, the venerable little tug assisted in the rescue and salvage efforts on the submarine USS Squalus (SS-192), which accidentally sank because of a massive mechanical failure off the coast of New Hampshire. Penacook was one of several tugs assigned to this difficult operation, but Squalus was successfully salvaged and brought back to port for repairs. Squalus was decommissioned, repaired, renamed Sailfish, and then re-commissioned in May 1940. Penacook was re-designated YTM-6 in May 1944, but was selected for disposal in September 1945. USS Penacook was sold for scrapping in August 1947 after almost 50 years of continuous service.